OceanFirst Foundation donated $30,000 to local military-based charities in 2010 as part of the Home Runs for Heroes program with the BlueClaws. Home Runs for Heroes, presented by OceanFirst Foundation, 92.7 WOBM and 1160 WOBM-AM, pairs nine military-based charities with positions on the field (including designated hitter, not including pitcher). 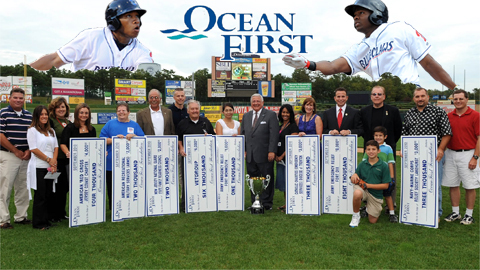 Every time a BlueClaws hit a home run at FirstEnergy Park, one of the nine charities received a donation from OceanFirst Foundation. “When our young men and women leave to serve their country, they leave families behind here in the States. We support those organizations that help those families and we support those organizations that help our soldiers when they come home,” said OceanFirst Bank President Vito Nardelli. Army Emergency Relief-Fort Dix led the way with $8,000, $7,000 of which came courtesy of home runs by BlueClaws first baseman Jonathan Singleton. VETGROUP, which benefitted from five home runs by BlueClaws catcher Sebastian Valle, earned $6,000. Founded in 1996, OceanFirst Foundation is the first foundation in the country to be established by a bank as part of an initial public offering. OceanFirst’s contributions to local charities continue to grow. In 2009, OceanFirst Foundation donated more than $1.2 million to community initiatives. OceanFirst Foundation has contributed approximately $20 million to over 600 local charities in Ocean, Monmouth and Middlesex counties since its inception. Its four priorities include Housing, Health and Wellness, Improving the Quality of Life, and Youth Development. For more information, visit www.OceanFirstFdn.org. OceanFirst Bank President Vito Nardell (center, with trophy) presents checks to recipients. The Greensboro Grasshoppers announced a new charity initiative, Guarantee To Give – Hoppers Playoff Pledge, today during a brief press conference at NewBridge Bank Park. The core of the pledge will be based on the Greensboro Grasshoppers going to the South Atlantic League playoffs for the first time in over ten years. All Grasshopper season ticket holders and sponsors will have the opportunity to select their local charity of choice, and a Hoppers 2011 playoff berth will result in 20 of the charities receiving a $5,000 donation. The winners will be announced at a date and time to be determined upon completion of the 2011 season. If the Hoppers do not make a playoff appearance, the Grasshoppers will donate $5,000 to ten local charities, for a total donation of $50,000. “Today was an exciting day for us as we announced a program that promotes the Grasshoppers making the playoffs for the first time in over ten years and also strengthens our commitment of guaranteed giving to the Greensboro community,” said Hoppers President and General Manager, Donald Moore. During the off-season, the RiverDogs choose one day each month to work with a local nonprofit organization. The day away from the office gives the staff a chance to give back to the Charleston community as well as a team building opportunity. For September the RiverDogs staff spent the day with Lowcountry Orphan Relief. Lowcountry Orphan Relief, Inc. is a non-profit organization providing goods and services to children that are victims of abandonment, abuse or neglect. The goal of the organization is to ensure that children coming in to the system will have in their possession clothes, toiletries, school supplies, and any other personal items within 48 hours. Located in North Charleston, the facility is stocked with underwear, socks, toiletries, books, toys, and a “clothing closet,” all of which are donated to the organization. In addition to providing necessities, LOR hosts fun events for these children to be enriched, nurtured, and loved. On September 22, the Charleston RiverDogs front office staff spent the day volunteering with Lowcountry Orphan Relief. The staff began the day by sorting clothing and book donations. Shelving and supplies were rearranged to make room for new supplies to be unloaded from the donations truck. The team worked to put together packages of age appropriate items to fill the orders for needy children that are constantly being received by LOR. The Gwinnett Braves announced recently that the Dream House for Medically Fragile Children, Inc. is the recipient of the Gwinnett Braves September grant. The $1,000 grant will be used to cover unreimbursed direct care costs associated with the Family For Keeps Transition Care Program. The proven Family for Keeps program provides education and services enabling families to care for these children at home. This gives children with complex health care needs a chance to be part of a loving home where they are valued and cared for effectively. Gwinnett Braves General Manager North Johnson will present a ceremonial check to the Dream House during the non-profit’s 8th Annual Music-on-Main fundraiser at Lilburn City Park on Saturday, September 11, 2010. Organizations interested in applying for a Gwinnett Braves grant can visit the Community page on gwinnettbraves.com for more information. The Kernels Foundation presented a check to Amy Geiger and Board Members of the Cedar Rapids School Foundation on Thursday, September 9, 2010 prior to the Kernels playoff game against the Clinton Lumber Kings. The money was raised in part from a season-long 50/50 raffle at home Kernels games. The amount of $17,162 will be divided between six local schools affected by the 2008 flood, which include Jefferson, Harrison, Cleveland, Roosevelt, Metro, and Wilson. The monies will help provide equal opportunities to outdoor physical fitness activities and fitness programs to school children. The Foundation is committed to providing programs and introducing better life skills and leveling the playing field for the children in these neighborhoods as compared to the rest of the city. This year’s project was phase II in the Foundation’s efforts to continue to help the flood victims in Cedar Rapids. The Kernels Foundation phase I project included building two new baseball fields and renovating a third that was damaged by flood waters. 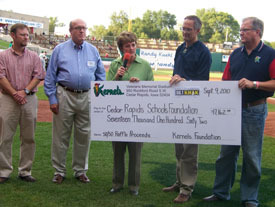 The Kernels Foundation, Minor League Baseball Charities, Baseball Tomorrow Fund, the City of Cedar Rapids, and others raised $170,000 in 2009 for the project. Because of the new playing fields, we were able to offer a free program to at-risk kids this summer. Seventy-five children were able to play baseball two nights a week at the Jones Park Complex for free, including the use of equipment and uniforms. The Kernels Foundation presented a check to Amy Geiger and Board Members of the Cedar Rapids School Foundation on Thursday, September 9. For the 3rd consecutive season, the Kernels teamed up with CarePro Health Services in providing a huge lift to Horizons “Meals on Wheels” by donating $5.00 to purchase a plate of hot, nutritious food for “Meals on Wheels” recipients for every run the Kernels plate in the 2010 season. The Kernels high powered offense, led the Midwest League in runs “plated” with 745 runs this season. At $5.00 per run “plated” by CarePro Health Services in their 3rd Annual “Plating for Plates” Campaign, CarePro Health Services Chief Financial Officer Gary Kaufman presented Horizons “Meals on Wheels” $3,725 on Perfect Game Field at Veterans Memorial Stadium before the Kernels game on Saturday Night, August 21st. The $3,725 contribution from C arePro Health Services to Horizons “Meals on Wheels” provided the area community home bound citizens who rely on “Meals on Wheels” for their sustenance with 745 additional plates of hot nutritious food! 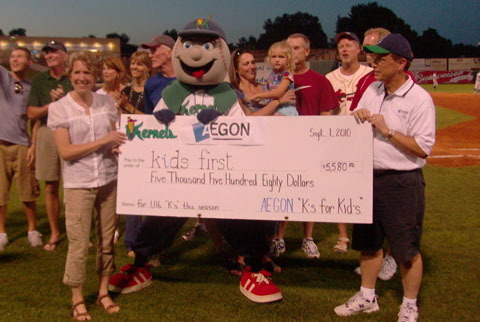 AEGON’s “K’s for Kids First” initial campaign was a success as it ran through the 2010 baseball season. AEGON is one of the world’s largest providers of life insurance, pensions and long-term savings and investment products. For every strikeout (K) that Cedar Rapids Kernels pitchers recorded, AEGON donated $5 to Kids First, a law center that gives children a voice in divorce and custody conflicts by providing legal representation and services for them. AEGON presented a check for $5,580 to Kids First on Wednesday, September 1 for the 1,116 strikeouts the Kernels pitchers recorded for the remainder of the season. Kernels mascot Mr. Shucks and AEGON officials present a check to Kids First on September 1, 2010. Over 2,000 girls and boys were recognized on Perfect Game Field at Veterans Memorial Stadium on Sunday, August 22nd for reading 1000 minutes this past spring and summer in the 12th Annual Kernels Summer Reading Program, presented by Toyota Financial Services and supported by The Gazette, Rockwell Collins, and Copyworks. Cedar Rapids Kernels players and Kernels Mascot, Mr. Shucks, greeted the 1000 Minute Readers in right-center field to sign autographs and pose for pictures with them for 25 minutes prior to the game. The girls and boys and their families were then cheered by the crowd as they paraded around the Perfect Game Field. Kernels players and Kernels Mascot Mr. Shucks visited a record 54 elementary schools throughout the eastern Iowa Corridor this past spring and summer to encourage over 25,000 students to stimulate their imaginations, discover new worlds, and make new friends through reading. Children were rewarded each 250 minutes that they read culminating with the Reader Recognition Day at the ballpark. After reading 250 minutes, the children reached 1st base and were rewarded with a free ticket to a future Kernels game and their name listed in the Cedar Rapids Gazette. After completing the next 250 minutes and arriving at second base, the kids received a free kid’s meal to Fazoli’s. The third leg, which takes the readers to third base and a total of 750 minutes of reading, rewards the readers with a Kernels equipment basket. 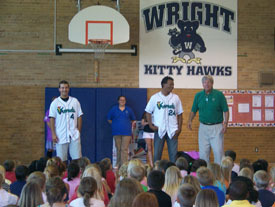 Finally, after reaching home plate and 1,000 minutes read, children received a Kernels jersey and the opportunity to meet the players. The Kernels congratulate all of the children who participated in the 12th Annual Kernels Summer Reading Program and thank 12th Year Presenting Sponsor Toyota Financial Services and contributing sponsors The Gazette, Rockwell Collins, and Copyworks for providing awesome rewards to the kids for their fantastic achievements. Cedar Rapids Kernels players sign autographs on the field during Reader Recognition Day on Sunday, August 22. The Wisconsin Timber Rattlers held a ‘Brewers Sunday’ promotion every Sunday home game as a tribute to their Major League affiliate Milwaukee Brewers. 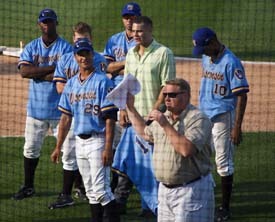 As part of the promotion, the players wore jerseys honoring the 1982 Brewers. 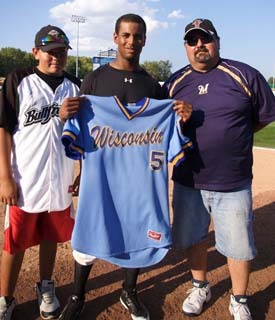 Throughout the season, the Timber Rattlers promoted a live post-game jersey auction to be held on the last Sunday home game of the 2010 season. Sunday, August 29th marked that last Sunday home game, and in spite of very warm temperatures and an extra-inning game, the live post-game auction resulted in proceeds well over $3000. A host of fans stuck around after the game to bid on their favorite players’ jersey for the good of charity while Representatives from the Children’s Hospital of Wisconsin were on hand to present each jersey to its winning bidder while the players stayed around for photos and autographs. The auctioneer even donated his time for charity. Timber Rattlers slugger Chris Dennis’ jersey went for the highest bid at $275. Four other jerseys also went for over $200 (Scooter Gennett: $250, Cutter Dykstra: $225, Kentrail Davis: $225, Andy Sauter: $225). The Timber Rattlers also placed a few of the jersey up for bid via Minor League Baseball’s online auction service. The event marked the first time the Rattlers hosted a LIVE jersey auction, which resulted in a total donation of $3,377 to the Children’s Hospital of Wisconsin…a definite success. Timber Rattlers gather on-field next to the auctioneer who works to get top dollar for their jerseys. Outfielder Kris Davis poses for a photo with the highest bidders for his jersey. School bells ring and the Hoppers are not looking for baseball players; instead the focus is on contributing inventory of pens, scissors, paper, paper clips, etc., to the Teacher Supply Warehouse. The Greensboro Grasshoppers donated $10,000 to the Guilford Education Alliance to be used for supplies at the Teacher Supply Warehouse, Hoppers President and General Manager Donald Moore announced Wednesday. The Guilford Education Alliance mission of quality education for all county residents becomes a reality through the Teacher Supply Warehouse. Over 170 teachers visit the warehouse, shopping for all the materials needed during their school year. The donated school supplies were purchased at the Walmart store on S. Elm/Eugene Street. Store manager, John Brewer, coordinated the $10,000 spend with representatives from the Guilford Education Alliance. The Grasshoppers are proud to partner with Guilford County Education Alliance and Walmart. However, this is not the first time the Greensboro Grasshoppers have stepped outside the ballpark to provide aid to the community.